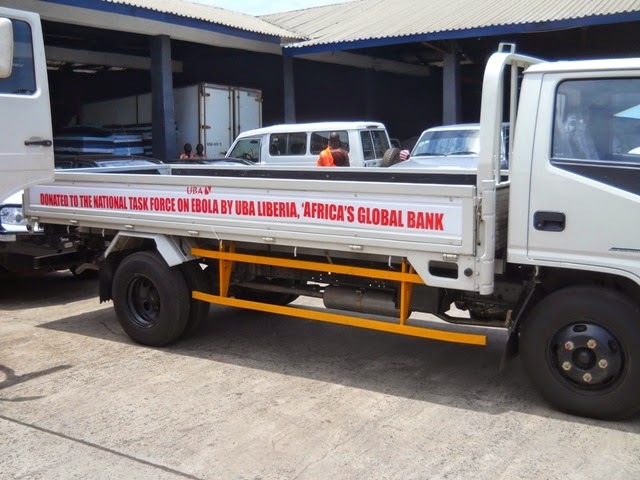 UBA Liberia (UBAL) on Monday, September 8, 2014 donated a brand new truck to the Government of Liberia to support the fight against the deadly Ebola epidemic in the country. Dr. Eugene Shannon- non-Executive Director of the Bank, representing the MD/CEO, Chioma Mang, presented the keys to Her Excellency, the President of the Republic of Liberia, Madam Ellen Johnson Sirleaf, at the General Service Agency (GSA). He also commended efforts of the government in managing the Ebola crisis. ‘We are pleased to offer a donation of a brand new truck to support the logistics of the Response Team on Ebola as our continuing corporate social responsibility to the people of Liberia.” He said. He assured the president that UBA Liberia will continue to observe the situation in the country and be a reliable partner in the Ebola war. Receiving the keys of the truck, President Sirleaf told the audience that it was the second time she has had the opportunity to meet the UBA Family to receive cash and material support to help stop the spread of the Ebola virus in Liberia. She thanked the UBA Family for the donation and said the truck will be used for its intended purpose. The UBA team included; two non-Executive Directors, Dr. Eugene Shannon and Dr. Wede Brownell, Her Excellency, Ambassador Chigozie Obi-Nnadozie of the Nigerian Embassy in Liberia, William Grant Jlopleh, Head - WSB, Tosha Brown - CRO, Eureka Coleman, Head- Public Sector, Steve Bundor-CFO, Gipli Oliver, Head-HR and Douglass Jones-Manager Brand & Corporate Communication. No Doubt, SEO is one of the most advance and Beneficial way of making double your ROI. We have been observed that Webmasters always in search after good SEO company in Dubai. Dubai is hub of Real estate and a big channel exchange for Human resources. SEO is best, affordable and competitive way to get the better results. I remember I how I wrote college admission essay using https://order-essay-online.net/blog/admission-essay and became a student. Since that time with help of my college I donate some money.